Frances MacDonald lives with her father in Alvanaig House, the big house on the Isle of Alvanaig in the Hebrides, which has been in the family for four hundred years, but at the beginning of the book we find that they are very short of money, and her father intends to let the big house, live in a smaller house on the island, and send Frances to school on the mainland. She is horrified by this idea, although her friend Donald has gone away the previous term. Her friend Ailie tries to comfort her, and wishes that she could go away to school. The next day Frankie, Ailie and her brother Keith go across to the neighbouring small island, Eilean nan Roin (the Island of Seals) where they are making the old croft house habitable so they can camp on the island. They go in Frankie’s boat, the Frances MacDonald, and later visit another island, Milvanaig, which is owned by an Englishman who refuses to allow people to land without permission – Frankie goes ashore but is seen by Mr Parks, and is convinced that the new tenant of Alvanaig House will be similar. This seems all too likely when the only answer to Mr MacDonald’s advertisement is from a Mr Sims of Lancashire, who is looking for a Scottish island to turn into a holiday resort, and thinks that his daughter, Mavis Elsie, a ‘real, romantic kid’, will enjoy living there. Thankfully another tenant is found, a Mr Mansfield from London, who wants to live there with his family. Mr Sims is furious, and offers more money, but Mr MacDonald refuses. Donald returns home, making the ‘clan’ complete, and the children manage to get permission to camp on the Island of Seals, but before this the MacDonalds move down to their new house, Alltbeg, with two of their servants, an elderly pair of sisters. 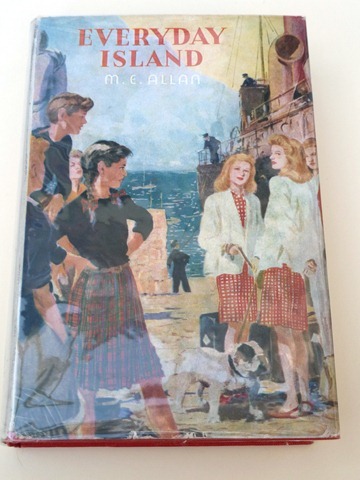 The next day the children are on the quay to meet the steamer bringing the Mansfields, and find that they have three children, Kay, Lewis and Rosemary, who are dressed in clothes which remind the island children of a fashion book, so they become known as ‘the fashion book children’. Kay slips and falls into the water, and proves unable to swim, much to their disgust. Frances is horrified by the arrival of the children, Ailie cannot believe that the strangers would want to be friends with them, and Keith wants to make friends. The Mansfields are surprised by the island, which is much more exciting than the ‘Everyday Island’ they were expecting. Next morning Frances and Donald go to swim, and find that the Mansfields are using Frankie’s boat. She is angry, and shows it, and when the next day she finds that her boat has been damaged with rocks, she immediately blames the Mansfields and accuses them when they appear. They deny everything, and the two parties are at loggerheads from that point. All except the youngest two, that is, as Keith finds Remmie stranded in the old castle, and helps her down. They make friends. The clan go to the island to camp, but several times their belongs are interfered with, or their boat set adrift. They cannot think who could be behind this if it isn’t the Mansfields, despite the fact that the Mansfields rescue Frankie’s boat, and the two parties are no nearer to making friends, apart from the youngest two. Mr MacDonald is still intending to send Frankie to school, and she rushes away to cry to herself, but Kay finds her, and tries to make friends again, but another attack on their camp puts paid to any thoughts Frances may have of burying the hatchet. In the meantime Ailie has come up with a plan to go to the mainland to visit her aunt in Glasgow, and ask her if she can live with her and her cousin and go to school there. She tells Frances, who can’t understand why anyone would want to leave the island, but agrees to keep her secret. That night the clan keep watch on the island, and manage to catch a glimpse of their tormenter escaping in a motor boat, which tells them for sure that it isn’t the Mansfields, as they only have a rowing boat. Keith and Remmie also see the motor boat on the island a few days later, and manage to see it going back to Milvanaig, the island owned by the unfriendly Englishman. They also see Mr Sims on Milvanaig, and tell the others, who realise that it is Mavis Elsie Sims who has been playing the tricks on them. The next night Ailie leaves to hide on the steamer to get to Glasgow, but just in time Frankie’s father tells her that Ailie’s aunt is on her way to Alvanaig to see her parents about her living with her there and going to school. Frances rushes off to the steamer, but doesn’t find Ailie until the boat has sailed, and they have a day in Fort William, during which Frances realises that life on the mainland might not be as bad as she has feared. Frances then goes to her old home to apologise to the Mansfields, makes friends, and invites them to camp on the island. They have been there a few nights when the weather turns, and they decide to leave the next day, but during the storm that night they find Mavis Elsie on the island, she has been out in the storm and is soaking wet. They give her shelter, but next day she is feverish, and Frances and Keith decide to row to the mainland for the doctor, despite the storm. They just about make it, and the doctor takes Mavis Elsie off the island in a motor boat. Mr Sims is very grateful, and gives Keith a boat, and Frances a lot of new books. Mr MacDonald tells Frances that for the next year she is to live at Alvanaig House with the Mansfield girls, and share their governess, before they all go to school the next year. Frances agrees to this plan, and it is also agreed that Mavis Elsie will spend her holidays on the island with them, making the clan up to eight. The majority of the book takes place on the island of ‘Alvanaig’. 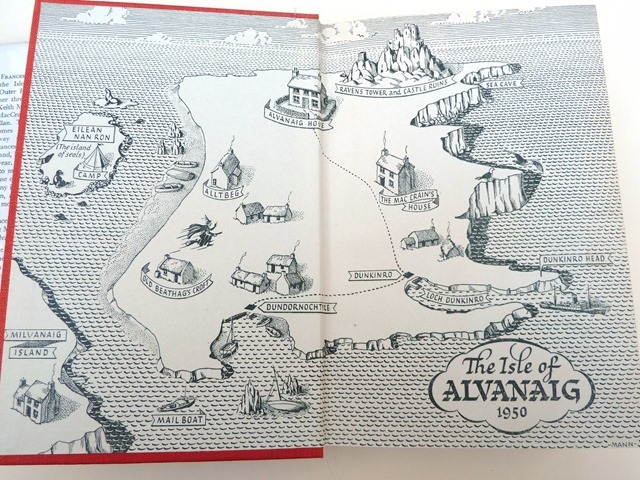 In The Background Came First, MEA writes that she first went to the island of Eriskay in 1938, in a red-sailed fishing boat, and that, “I think Eriskay is there is most of my smaller islands.” The map on the endpapers of the book is certainly similar to Eriskay, and it is similar in dimensions, too – Alvanaig is described as being about two miles wide (the big house is said to be just under two miles from the steamer pier). Frances and Ailie catch the ferry to Mallaig, and thence take the train to Fort William for the day. In More About Being an Author, MEA talks of her liking for Katherine Oldmeadow’s books, and says that “…the discerning may find echoes of her style in one or two of my own early books, especially in Everyday Island.” I’ve only read one Katherine Oldmeadow book, and that was a while ago, so I can’t comment. 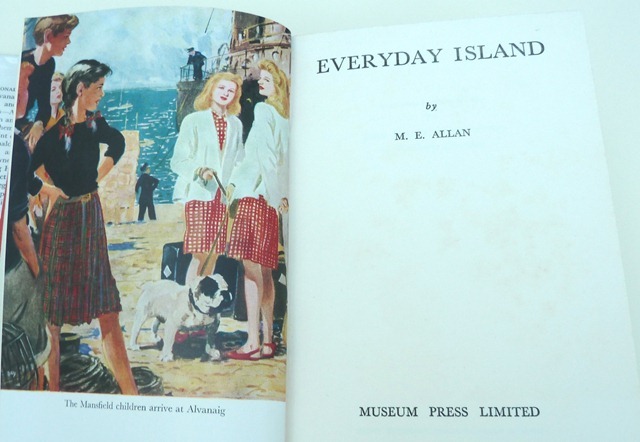 There are echoes of Philomel Follows After, one of MEA’s very early unpublished books, in Everyday Island – both books have characters called Kay and Ailie, with the Ailie characters being quite similar, and in both books a group of children refer to themselves as ‘the clan’. Frances reappears in Two in the Western Isles, where we learn that the school to which she has been sent is Dundonay House on Skye.